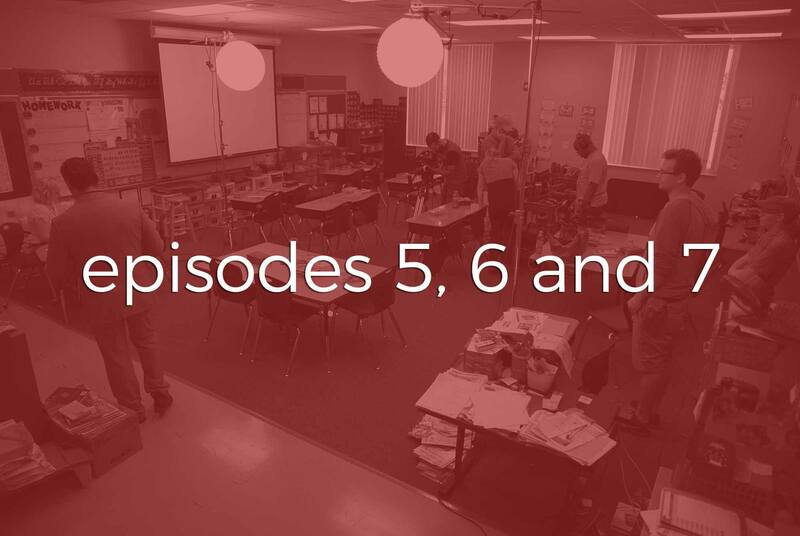 With Episodes 1-4 of The Teacher Project completed, we were now ready to film Episodes 5, 6, and 7. Each episode took about two days to shoot, so by this time, the cast and crew had established a good rapport. And it was showing. The casts’ characters were finding that groove that a successful sitcom would have, reacting off of each other. This made shooting the final three episodes a lot of fun. This is also the point in the series, where you can see a shift away from the documentary style. We still kept it in certain scenes, but just had to deviate from it to get the whole story to flow together. Nothing showed that rapport better than in Episode 5, with Mr. Diggins, played by Bryan Cobaris and Nancy Childress, played by Tracy DeCresie. These two had a few funny scenes already, but the ones in Episode 5 is some of the funniest scenes in the entire series. The timing these two exhibited was just top notch. This was also the “social media” episode, a story idea given to us by our friend Eric Voorhies. He came up with this clever idea to incorporate social media within the episode, and it turned out very well. Thanks for the idea Eric! When we filmed Episode 6, we tried to bring in some back story with Brooke, played by Heather Danner, by introducing an old boyfriend who has come back into town. The idea was to have Greg (Chuck Fonshell) notice this tension and have a slightly jealous reaction. This would in turn make him see Brooke in a different way, a way Brooke really wants. There was some difficulty creating all of these emotions in just a 10 minute episode. I usually am my worst critic, and I feel this episode was the most difficult one in the series to write. Episode 7 was one of the first episodes written. I think I actually wrote this episode third, after writing the pilot and Episode 2. There was always a plan to showcase Parent Conferences and how unique they can be. In my 14 years as a teacher, I have had many strange conferences with parents and this episode gave me a chance to show others what we as teachers have to deal with. So the three conferences we show in the episode are actual conferences I have had over the years. All of them have very little exaggeration. Episode 7 also has a pretty interesting ending. It was always the plan to end the season with a great cliffhanger; something to hook you in to possibly more episodes. So, if you haven’t already watched The Teacher Project on YouTube, please give it a chance. All seven episodes are now available to watch, and who knows, maybe one day you will see more.